Celebrate Chris Froome's magnificent victory at the 2013 Tour de France with this montage of 5 photographs from the centenary Tour. The montage features the moment Chris Froome and Team Sky cross the line in Paris as the main photograph. 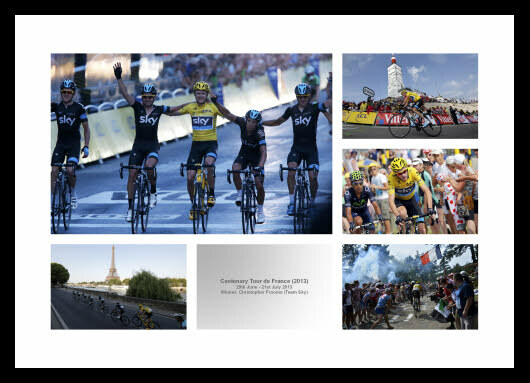 In addition, there are 3 superb images of Froome's famous victory on Mont Ventoux and a superb photo of Team Sky in Paris alongside the river Seine with the Eiffel tower in the background.